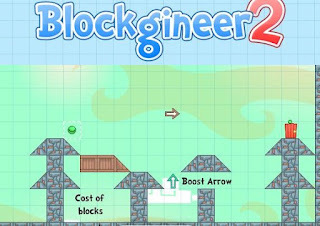 Blockgineer 2 is a new point and click physics based puzzle game from Submu Entertainment in which your objective is to guide the colored smileys to the their respective doors by placing blocks strategically in the field. You are given different kinds of shapes that you can utilize to build ramps or fill gaps so that smileys will be able to go around obstacles and get to the right door. The first Blockgineer game is good but this sequel is way better in terms of art style and animation. Plus I think the physics aspects just got smoother in this one. The level of difficulty is intermediate to hard but not impossible to beat -- if you can make it through a few trials and errors, you should get right in the end. What's cool about this game is that you can share your solutions via the solution code. Meanwhile, here is a full Blockgineer 2 walkthrough showing how to beat it with 3 stars.